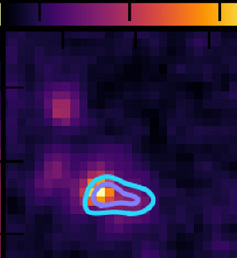 The Spitzer infrared image of a distant infrared luminous galaxy, overlaid with millimeter intensity contours of the source from the Submillimeter Array (the field of view of the image is about 10 arcseconds). Astronomers have studied about sixty similar luminous galaxies in early evolutionary stages whose light has been traveling towards us for about ten billion years. NASA/Hill et al. Astronomers in the past decade have detected thousands of galaxies dating from epochs only a few billion years after the big bang. Many of them, discovered in deep optical and near-infrared surveys, are low-mass galaxies, and are faint and difficult to study. More luminous, massive star-forming galaxies should are present but these large objects are difficult to assemble so early in cosmic time and there are not as many of them. These star forming galaxies contain dust that absorbs stellar radiation and emits strongly at far infrared and submillimeter wavelengths; the Herschel Space Observatory surveys spotted about ten thousand candidate sources whose infrared colors suggested there were distant galaxies. CfA astronomer Glen Petitpas was a member of a large team of astronomers who used the SCUBA-2 (Submillimeter Common User Bolometer Array) instrument to confirm 188 of the reddest of these sources as indeed being distant, dusty star formation galaxies, typically so far away that their light has been traveling towards us for over eleven billion years, and so bright that they must be making stars at a rate many thousands of times faster than does the Milky Way. In a related paper, Petitpas was joined by CfA astronomers Mark Gurwell, Giovanni Fazio and David Wilner and their colleagues to use the Submillimeter Array to image some distant SCUBA-2 galaxies (although a set that is a bit closer than the above sample: their light has only been traveling for a bit over ten billion years). They targeted seventy galaxies with the SMA and detected sixty-two of them, including three pairs of galaxies that can be classified as colliding systems (the others may also include some mergers that are not spatially separable). The scientists show that the descendants of such huge galaxies in our local universe are probably massive elliptical galaxies, and that about ten percent of their stars probably formed in short bursts of activity in this earlier phase of their evolution. “High-Resolution SMA Imaging of Bright Submillimetre Sources from the SCUBA-2 Cosmology Legacy Survey,” Ryley Hill, Scott C. Chapman, Douglas Scott, Glen Petitpas, Ian Smail, Edward L. Chapin, Mark A. Gurwell, Ryan Perry, Andrew W. Blain, Malcolm N. Bremer, Chian-Chou Chen, James S. Dunlop, Duncan Farrah, Giovanni G. Fazio, James E. Geach, Paul Howson, R. J. Ivison, Kevin Lacaille, Michał J. Michałowski, James M. Simpson, A. M. Swinbank, Paul P. van der Werf, and David J. Wilner MNRAS 477, 2042, 2018. “Red, Redder, Reddest: SCUBA-2 Imaging of Colour-Selected Herschel Sources,” S. Duivenvoorden et al., MNRAS 477, 1099, 2018. 1 Comment on "Astronomers Confirm Galaxies in the Early Universe"